A pretty big year for me, sporting-wise, and lots of blogs. Winter draw(er)s on, as they say. The period from the end of September through to early January is the longest spell of the year for me with no competitions, and is the time to get down to serious things like strength training and conditioning. And by and large, as I pen this in mid February, it all seems to have gone well. I only missed a few days due to a cold, though I converted several intended track training sessions into additional gym work when the temperatures dropped (and stayed) below freezing in December and January. Not cowardice; I just wasn’t going to be able to train fast and keep adequately warm. My body fat levels seem to have fallen quite a bit in the last year, and I now find I feel the cold far more than ever I did when, for example, I was serious about my cross-country skiing. My 2009 return to competition came at the coldest weekend of the winter, but on the cosy indoor track at Brunel University. All went to plan, though I found myself asleep on the blocks in both 60m races. Two weeks later, at Sutton Arena, it was time for three more races. My starts were a shade better, and I was faster. I think I even headed the UK M50 rankings at 60m for a short while. Pleasing for someone who turns 55 in less than a couple of months. 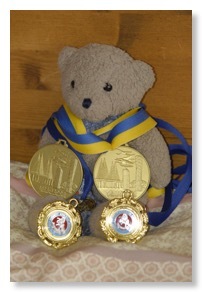 I managed a couple of medals at the SCVAC Championships, and have an EVACs open meeting coming up very soon. It will then be time for my M50 swansong at the BMAF Championships. That will complete my competitive preparation for the European Masters Championships in Ancona, Italy, later in March. A delightful prospect, as these begin just three days after I turn 55. At the British Masters Indoor Championships in early March, I surprised myself. I’d not made the finals of the 60 metres for two years, but this year, not only got that far, but then ran 7.82 for fourth place. This was the fastest I’d run since the World Indoors in Linz in March 2006. Mind you, my 200m times were still dire, even though I ran well enough for fifth place in the final. I just kept consoling myself with the thought that, with the European Championships in Ancona still more than a fortnight away, I was sure I’d not peaked yet! Ancona was fun, and hard work. A major championships over a week demands a whole additional level of effort and personal organisation than domestic competition. Roughly double those demands when you add in the fact that I also spent the whole time as one of the official photographers for the European Veterans Athletics Association, and for the Great Britain Masters Team. The Championships took place in a very modern and well-equipped stadium, and, overall, they were extremely well run. I had good hopes in the 60m, being just three days into the M55 age group, but got eliminated in the semi-final. However, it finally all came right in the 200m. I won my heat, took third in my semi-final, and fifth in the final. I was one of three Brits in that final. The winner, Steve Peters, set a new European M55 record. The week was capped by a silver medal in the 4x200m relay. I was really pleased with my lead-off leg in the relay, but overall, we didn’t quite manage to hold the German team off, and lost the gold by 7/100ths of a second. That’s around six inches after 800m of flat-out sprinting. There were several occasions in Ancona where I had to be really strict with myself, and put the “athlete” head on very firmly. This meant that there were big chunks of the action when I wasn’t taking photographs. I’m writing this stuff about a week after Ancona, on the day of the tragic L’Aquila earthquake. My thoughts go to any Italian friends living in that area. I am rather enjoying about two weeks off training and racing, to allow my body to recover, though I currently seem to have found plenty to do to fill the time, so I’m not getting as much rest as I’d perhaps hoped! The summer track season is just three weeks away…. Looks like we’re getting one this time, but why are so many tracks built with the home straight facing the prevailing wind? It’s been an unusual start to the track season. Kent Masters League began early, and I regret that I had to run a 400m in the second fixture. To rub salt into that particular wound, I had to race in the M35-49 age group too. Ouch. Then there was an unusual gap, and I got a holiday – no running involved! Then it was back to business, with Club Championships, and a League match followed two days later by the SCVAC Championships. These suffered from good entries and poor turn-out on the day. Sorry fellow athletes, but that just isn’t good enough. Are there really that many good competitions for Masters athletes that you can pick and choose like that? I managed a few wins, and some hard races during June, but my times were all off the boil. Mind you, so were those of the guys I beat. I was ready for a hard weekend at the BMAF national championships at the start of July. Only two races, but I knew I’d be on my feet the rest of the time taking photos. So it transpired. I ran a great 100m. No, correction, I ran a great 99m, and got pipped for second place literally on the line, by just 3/100ths of a second. That’s something like ten centimetres, or four inches in old money. The 200m next day was a wake up call. I had a hectic morning behind the camera, and raced at around 2pm. Unusually for me, I completely forgot to snack during the morning, though I drank a lot of energy drink. Result? Good first 100m, uncomfortable next 90m, then WOW! Ever felt rooted to the spot? I was, and lost a certain silver medal as I ran out of energy instantly. After crossing the line in third, my whole body seemed to have pins and needles – even my teeth. A cup of tea with about eight sugars, and half a pack of jaffa cakes had me sorted in about 30 minutes, but I never want to experience what cyclists call “the bonk”, and the French “la fringale” like that again. What bad timing for a self-inflicted wound. A few days later, I was back racing almost half a second faster than my Birmingham times, and the build up to the World Masters in Lahti continues. I felt driven to get some of this stuff down in print before the colours fade in my memory! There are hundreds of photos from Lahti on this web site, but the article below is shot “from the inside looking out”, as it were. 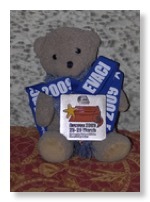 The 2009 World Masters Athletics Championships in Lahti were for me personally a wonderful experience. As usual, it was damned hard work trying to mix a full programme of races with photographic commitments at a championship that was spread over at least four venues, one of which was 20km away from the others. It was clear from early on that I’d reached Lahti in good form on the track, too. I simply wasn’t going to compromise my chances by trying to be everywhere. Many thanks to the Great Britain Masters medical team, who kept me on my feet even when I probably shouldn’t have been on them in the first place! I liked the main stadium track. It had had some sort of blue resin coating put over the original surface. This made it hard on the Achilles tendons, unforgiving if you fell, slippery when wet, but also pretty fast. I felt really comfortable in my 100m heat and semi-final, with my season’s best times, and had Lane 1 for the Final. I had qualified as sixth fastest overall. Getting to that final had been one of three targets I’d set myself for 2009. There was a false start. I had got away well. I remember walking back disappointed. However, when we did go, I flew! I recall reaching about half way and thinking “This feels wonderful!” Running through the finish, I glanced to my right, to judge where I’d come, and realised I was fifth. When the 12.15 time was displayed on the scoreboard, I was over the moon. It’s at this point I probably ought to have sat down and re-appraised my 200m chances, beginning next day. Instead, I picked up the cameras and went back to work, as is my habit. The warm and sunny Lahti weather continued into Sunday. It was difficult getting sleep, having the sun shining brightly at 4am and still doing so after 9pm. Unfortunately, Lahti was also a noisy town almost every evening, and particularly on Saturdays. The clubs and the drunks were quickly followed by the street-sweepers, so I was frequently awake as the sun came up. I had no serious after-effects from three rounds of 100 metre racing, and was enthusiastic for my 200m heat. As is always the case when you feel good, I’d decided I’d do “just enough” to qualify for the semi final. Coming off the bend, and feeling really relaxed, I thought “Ah, why not win it?”, and didn’t ease off as much as I’d planned in the last 20 metres. My reward was to be the second fastest qualifier overall for the semis, and to run a season’s best. It felt rather easy. The cameras stayed in the hotel next day. I felt like a smoker with no cigarette. The 200m semi final was around noon. Again the plan was to “do enough”. It worked this time. I cruised down the straight just behind Canada’s Kerry Smith (who was eventually silver medallist in the final), aware we were both well clear of the field. As it turned out, had I made a chase of it, I might have given myself a new personal best time. However, to make a World final, as third fastest overall from the two semis was reward enough, and the second of this year’s targets was in the bag. We were held a long time in the pre-race Call Room before the final. As we came out into the stadium, we found it had poured with rain meanwhile, though the sun was burning it off fast. Ideal conditions for me. There had been a mix up over lane allocation which we didn’t get sorted until moments before the race began. This was good diversionary stuff, and helped mask how nervous I could have been if I’d thought about it. Could I have run a different race? Hindsight gives you 20/20 vision, of course. Canada’s Tom Dickson ran a better bend than me, from the lane just inside mine. I could hear him. Still, I felt I was in contention coming in to the straight, and a moment or so later, realised I was probably third. I could see Steve Peters and Kerry Smith ahead, and only sense the others. The last five metres were the longest of my running career. I was spent. I desperately wanted to dip for the line, but had nothing in my calves to let me push forward. As I crossed the line, Tom Dickson, as tired as I was, fell on my left, hitting the track hard, and sliding at my feet. I almost couldn’t be bothered to jump over him, but just managed to avoid adding my spikes to his inevitable cuts and grazes. I sensed he’d just beaten me. When the results came up, I was fourth. 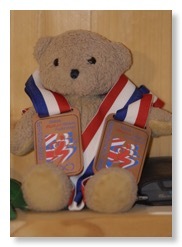 Two hundredths of a second – the width of Tom’s shoulder as he fell forward – had given him the bronze medal, not me. Was I disappointed? No, I can honestly say I wasn’t. I had jaw-ache next day from smiling and laughing. I’d performed above my expectations. Target three for the year was the one I’d had most trouble connecting with. It was the one I was least prepared to discuss openly, for fear of putting undue pressure on myself. It was to get in the top five in the Lahti 200m final. Several days later, Wally, Geoff, Steve and I were big favourites for the 4x100m final, and didn’t disappoint, running the second fastest time on record by a GB M55 squad. Top step of the podium was fun, and the fortnight’s pressure evaporated in the warm sunshine. But I’d trade that relay race just to be in the 200m final again, any day. Funny how quickly you come down to earth with a bump, isn’t it? Almost every time I have been to a big international track and field championships, I’ve come home with some sort of bug that’s laid me out. Dunno why I expected Lahti to be any different. Anyhow, within two days of returning from the World Masters, I had a full-blown streamer of a cold, and a day’s anxiety about whether it might, in fact, have been swine-flu. Being a man, I do colds very badly, of course. What this one did for me was quickly make the high energy environment that was the World Masters in Lahti seem like a million miles away. It had me wondering whether the “me” in the photographs people were beginning to send me from the Championships was the same “me” who was currently dosing up on paracetamol and decongestants, and feeling very sorry for himself. It was very therapeutic to get home and write some recollections of Lahti for the web site. 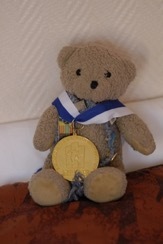 The World Masters gold medal for the sprint relay was great, but my dramatic failure to win the bronze medal in the 200 metres has evidently give me and others much more to talk about. I’ve little doubt that it is the little things that didn’t go right in that race that will be the motivating factors nagging away in the back of my mind through this winter’s training. On the other hand, the sprint relay involved four of us, all pretty much at the top of our game. Aside from the ever-present risk of dropping the baton, our win was always on the cards. By the way, there is video of the relay here. I’m on third leg. But I’m anything but blasé about that relay win. A gold is a gold, and a World Championships Gold is pretty much as good as it gets for a 55 year old rejuvenated sprinter. If you want to see how simply taking part can make a major impression, read this piece by my American friend Ken Stone, who ran anchor leg for the USA in the same race. Ken has put together recollections in an article of true quality that had me quite choked up the first time I read it. Ken was also kind enough to write a small article about me and my camera work for his web site. 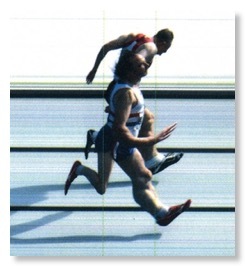 It includes a photo of the finish of my 200m race that I’d not seen before. It’s here. I raced at the Masters Inter-Area competition eight days after returning from Lahti, and about two days after my cold had subsided. It was really one competition too far, and I’ve decided to take ten days completely off training, while I try to let my feet and Achilles tendons recover from the abuse they’ve had lately. I’ve spent lots of time watching the World Athletics Championships in Berlin. I’ve seen some pretty close finishes there, and can honestly say that, to the naked eye, the two hundredths of a second by which I lost that Lahti bronze doesn’t look like a very big gap. I’ve just run my final race of 2009, as I write this. It should have been the Kent Masters 200m. For me, it was the Kent Masters 180m. While leading, with 20m to go, my lower right calf, or Achilles tendon area suddenly tightened right up, and almost brought me to an abrupt stop. I crossed the line, was somehow still third, and was rewarded (if that’s the word) with a time I really don’t want to see on my CV! The race was at about 1.30. The silly thing is that until about 10.30, I had decided not to race. Next time I make a decision like that, I’m going to stick with it. 3) The risk of injury increases exponentially in those circumstances. It was all very annoying, really. The previous evening, while I was packing (remember, at that point I wasn’t going to run), I couldn’t find my Achilles tendon strap (it’s been sore since Lahti). I ought to have taken that as an omen. I’ve had a happy nine months, by and large, but as my previous blog entry suggests, things went downhill pretty fast after Lahti. Last weekend, I was photographer at the British Masters decathlon and heptathlon championships in Oxford. In addition to the athletes taking part, I met a number of Great Britain Masters team-mates. All agreed that, after Lahti, they had nothing left in the tank for several weeks, and some hadn’t replenished it yet. I’m now heading into a time of year I actually find quite hard. The prime objective is to get some quality rest. I need to couple that with some good eating, vitamins and so on. My problem is that, while I can sleep for Britain, and be a real slob is I need to be, I don’t do prolonged spells of inactivity very well. Previous attempts at three weeks “off” at the end of the summer season have fizzled out after about 10 days or two weeks when (and I can only really describe it this way) my body just got bored and began to crave exercise. Adrenaline withdrawal symptoms perhaps? Whatever, here we go again. I’ve just had a month off from any form of training or strenuous physical activity. No, don’t fret, it was by choice, not medical advice. Mentally and physically, I was pretty down by mid September, and motivation to do very much had gone out of the window. I’ve always tried to have about three weeks off at the end of each summer track season, but usually my body has got bored by the end of a couple of weeks, and I’ve drifted back into training. This year, the plan was to stay inactive for four full weeks, and do a series of benchmark tests at the end of that period. It’s proved to be a very good opportunity to assess this year, look at my goals for the winter, and my ambitions for next summer. That’s been done, allowed to rest on paper for a few weeks, and then been reassessed. I tweaked it a bit, but I’m happy with it. And no, I’m not revealing it yet. I didn’t go to the World Masters Games in Sydney, which took place in mid October. Although my performances in Lahti would have given me at least one individual medal in Sydney, if I had repeated them, I’m very comfortable with my decision to cut the competitive season in mid-September. Carrying on until mid-October would have been unthinkable unless I’d had the chance to have a decent break somewhere in the mid summer. It’s been good to follow the Games on the internet. Great to be able to get results, video and gossip from a Masters meet on the other side of the world within hours. Competitor numbers were impressive, though 95% seem to have been Aussies. Overall levels of performance weren’t as good as Lahti . This was what people expected, but I do wonder whether that will be the case by the time the next WMG comes around. It will be in the same year as a WMA championship again in 2013, but WMG is going to be in Turin, Italy, while the WMA champs will be in Porto Allegre, in Brazil, whose bids and promises have failed to impress many, me included. Won’t be any surprise if the cream of European Masters choose Turin and give Brazil a miss altogether. It’s a long way off, though. I’ve also decided not to enter the World Masters Indoor Champs in Kamloops, Canada, next March. It’s a very long and costly way to go for a few 60m races and a couple of 200m events. It’s at the start of March, and means the British Masters Indoor Champs are being moved to the end of March. For me, that makes them a very good end point for my winter work, and a precursor for the outdoor season. The tests I underwent were a series of “baseline benchmarks”, all repeatable when needed, aimed at checking where my body is at right now. They covered body symmetry, flexibility, core strength and stability, and some of the usual stuff like blood pressure and body fat. We finished with a VO2max test. I hadn’t done one for years, but this (happily for my well-rested body) was a sub-maximal test, and hardly had me breaking sweat. At time of writing this stuff, I’m waiting for the report. But in a few minutes, I’m off to start training again. Very introspective, this one. Apologies, but it’s good therapy for me! Although racing seems a long way off – both races past and races yet to come, it surprised me recently to realise that I’ve now been training again for five weeks. The time has gone very quickly, and it’s been quite enjoyable getting into a routine again after my post-season break. At the moment, the routine is all gym-based stuff, with a couple of days rest after each session. In terms of work, it took me a few weeks to feel that I’d overcome any drop-off in fitness during my month’s rest. This was probably mainly a mental thing, because heart rate and all the usual indicators seemed fine from the outset. My overall plan is to move things forward during the winter in three week blocks, each building on the previous ones. No rocket science. The benchmark tests I did in October (see previous blog) identified some shortcomings in my overall range of movement in some respects, and I’m trying to address these right from the outset – hip flexibility, shoulder rotation, ankle flexibility. I may be too late, of course. These problems generally relate to past injuries. Along with my legacy of long-term back problems, I may sound like an old crock from this description, but I actually feel physically more stable and stronger than at almost any other time. I do find it hard to credit the work I was doing in training at this point last year. I am about 3-4 weeks “behind” that point, intentionally of course. Once or twice I’ve felt a little bit of panic about it, but knowing that I’m in control and following a plan soon kills that off. Gratitude to my GB Masters team-mate Steve Peters for helping with the mental training involved. It’s important to live in the “now”, as in “That was then, this is now”. I’m not competing against what or who I was a year ago. Track work starts again very soon. I don’t ever do a huge amount on the track at this time of year. In the main, that’s because it seems rather self defeating to wrap up warm, spend ages getting (and keeping) warm, and to have to worry all the time about avoiding injury. I have some opportunities to work on a stretch of indoor track, but this is often being used for other purposes, or simply closed. I’m uncertain at present whether my Achilles tendons have recovered from the late summer pains. They still ache in the morning, but seem to be coping with normal life and the gym work. And that’s about it. Not very exciting, I’ll admit, but November seldom is!